ST. LOUIS (AP) — Alex Pietrangelo isn’t quite sure how the St. Louis Blues turned their season around. But the veteran defenseman couldn’t help but grin Thursday night after his team used five first-period goals on the way to a 7-3 rout of the Philadelphia Flyers. On Jan. 3, the Blues had an NHL-low 34 points. On Saturday, they will host Vancouver in the regular-season finale with a chance at winning the Central Division title. A major about-face in just 89 days. “It’s a testament to how hard we’ve worked to turn this thing around,” said Pietrangelo, who fueled the early blitz with three assists. Alexander Steen finished with two goals and 13 players recorded at least one point as the Blues improved to 8-1-2 since March 16. The Blues scored five times in the first 9 minutes, 41 seconds to set a franchise record for the quickest five-goal start to a game, eclipsing the previous mark of five in the opening 13:45 set on Jan. 3, 1970, in a 6-0 win over Pittsburgh. St. Louis is one point behind first-place Nashville, which has 98 points after beating Vancouver 3-2 on Thursday night. The Blues are tied with Winnipeg for second with 97 points. The Jets lost in overtime to Colorado on Thursday, The Central title will decided Saturday as all three teams close the regular season. Steen pushed the lead to 3-0 with a short-handed goal off a pass from Oskar Sundqvist. The wild contest featured eight first-period goals. “Like pond hockey,” Pietrangelo said. 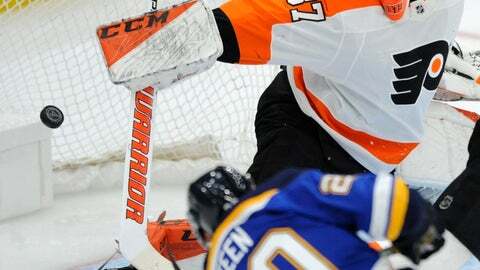 The Flyers fell behind 4-1 as the Blues scored on four of their first five shots. Elliott was pulled after just 4:39. NOTES: St. Louis D Joel Edmundson returned to the lineup after missing the previous 11 games with a lower-body injury. … The Blues have won six of their last eight at home against the Flyers. … Philadelphia went 22-10-2 from Jan. 10 to March 27 to climb out of last place. … Giroux has 22 goals and 61 assists through 81 games and will finish as a point-per-game player for the second year in a row.